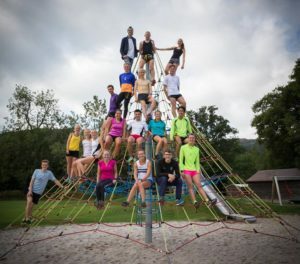 September training camp went on a Highland adventure this year, with about 30 intrepid Hareys venturing up to Pitlochry for a week of training, coinciding conveniently with the Pitlochry Highland Games. Most arrived at the Atholl centre on Thursday 6th , which turned out to be a pretty perfect base camp for the week with a fantastically kitted out kitchen, tons of space, laundry facilities, a TV lounge and even a table tennis room (which soon became home to an ever-growing collection of foam rollers and tennis balls). The running (and cycling) options from the doorstep had something to suit everyone: from the 841m high nearby Ben Vrackie (which to our surprise had a summit plaque donated by the Leys School, Cambridge from their stay in Pitlochry during WW2), to the picturesque forested loops along the rivers Garry and Tummel and even some flat playing fields for those who couldn’t be torn away from their ritual of grass laps. The weather for the week was suspiciously good, with bright sunshine, mild temperatures and such limited rainfall that you would forget you were in Scotland if it weren’t for all the kilts, bagpipes and haggis. Saturday was the day of the Highland Games, starting with a pipe band procession through the streets of Pitlochry. The atmosphere was incredible, with 3000-4000 spectators over the course of the day, but somewhat different to most races we had ever participated in, not least because of the announcement on arrival that all the races were moved forwards by 90 minutes. 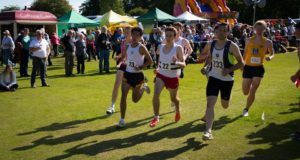 They were all held on an unorthodox 320m grass track, and many of the races took a handicap format with athletes starting at different distances in front of the fastest on paper. 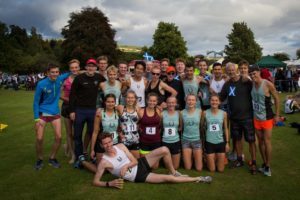 Ollie Fox ran every event ranging from the 90m to the 3200m (with some harsh handicaps) and won three races (the 3200m, the 4x160m relays and the scratch (no handicap) 1600), earning himself the title of Champion of the Highlands over 1600m, and a good bundle of cash. Dom Jaques did almost all the events but missed the start of the 400m, while James Ackland won the handicap 1600m. Joe Massingham and Niamh Bridson Hubbard took second and third in the 3200m handicap race that saw Nancy Scott, MacGregor Cox and fresher Phoebe Barker take the last three money prize winning places. That evening we celebrated by making 15x Delia Smiths recipe for pancakes, and made a trip to the local pubs to splash some of the cash we had earnt (always putting back into the local economy). Some results can be found here. Sunday morning was Long run day, which many followed with a hike up Ben Vrackie. In the evening we had perhaps one of the more unusual entertainment choices of making about 20 origami sharks led by Josh Cara from YouTube (you may ask why, but we have no answer for that: perhaps the previous evening entertainment of a quiz night and whisky tasting trip had been too “mainstream”). The most notable occurrences of the following day were the arrival of the new food order just a few hours too late (so that many had resorted to making their own bread with varying degrees of success), and the road trip to see Schiehallion (the mountain where the G constant was measured) and the town Dull which is paired with Boring and Bland, and appropriately lived up to its name. Iain also led a group core session, just in case the rest of our bodies weren’t sore enough already! Tuesday was a group session day, so we returned to the site of the Highland games for 2x15mins tempo and 4x30s strides. Some followed with a much-needed ice bath in the river, whilst others numbed the pain with a whisky tasting trip to the local distillery later in the day. The final full day on Wednesday was again filled with running, some finishing with a swim in the Loch and then some fun activities. 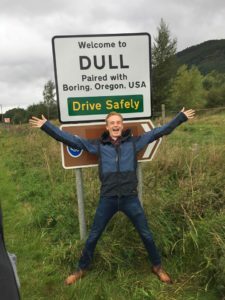 There was a divide in the group between a road trip to see Macgregor’s cave and a rowing trip on the loch, both sides claiming to be having more fun. The jury is out on that one. On the return to the centre we cooked up all the leftovers into something resembling a normal meal, and also had the kilo challenges which have become a standard feature of training camp by now. 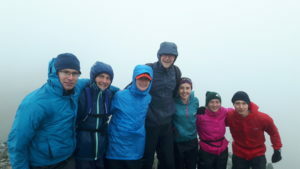 On departure, most made their way back home via train or aeroplane, with the exception of 3 cars that travelled to Glen Coe where 5 Hareys were participating in the Mamores Vertical Kilometre race (part of the Salomon Skyline Scotland series) and finally got to experience some more typical Scottish weather. The race covered 1000m elevation gain over 5km and had an extremely international field. Competitors set off at 30s intervals, and by the time the 5th Harey was starting, the commentator had certainly noticed Cambridge’s presence. Luke Fisher and Rob Waddy were 39th and 45th= respectively in the Men’s category (9th and 11th British finishers) in times of 48:46 and 49:43 while Lizzy Apsley, Nancy Scott and Fiona Bunn were 19th, 32nd and 37th in the Women’s category (3rd, 7th and 8th British finishers) in times of 58:13, 63:10 and 64:13. Results can be found here .